Hours of operation: ​For practical purposes, the Greensboro Arboretum is open from sunrise to sunset. Officially, the Arboretum opens daily at 8:00 a.m. The closing time varies with the season. In the cold season (November through February) it closes at 5:00 p.m. In spring (March and April) it closes at 7:00 p.m. During the warm season (May through August) it closes at 8:00 p.m. In fall (September and October) it closes at 7:00 p.m. Directions: If approaching from I-40, take the Wendover exit north toward Greensboro and away from High Point. Take the Market Street exit from Wendover and go west away from downtown. From Wendover, go 0.5 mile to Ashland Drive and turn left (south). Continue on Ashland 0.4 mile to the Education Center. Note: In some early publications the main entrance was listed in as being just off West Market Street at the beginning of Starmount Drive, although this actually is a large parking lot next to the ball fields in adjacent Lindley Park from which one would walk into the Arboretum. (There are several other entry points into the Arboretum.) The better choice for wildlife watchers is to enter a half-mile south near the Education Center at 401 Ashland Drive where there is a small parking lot across the street and limited street-side parking. The Greensboro Arboretum is a long narrow 17-acre “island” located in the Lindley Park neighborhood in a densely-populated suburban area only a few miles west of the Greensboro central business district. It is adjacent to and can be seen from a busy highway, Wendover Avenue, near the Market Street exit. The park was developed through a cooperative partnership between the Greensboro Parks & Recreation Department and Greensboro Beautiful, a citizen-based, non-profit organization. 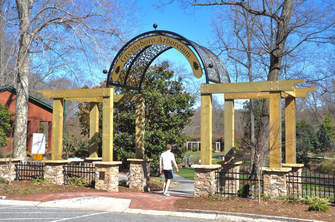 There are about fourteen permanent plant collections in the Greensboro Arboretum. Visitors can stroll on approximately 2 miles of paved and unpaved paths that meander through gardens that are planted with perennial and annual plants. An Education Building on site is used for occasional gardening programs. Usually the building isn’t open unless an event is going on, but there are restrooms on the side of the building that are accessible from outside the building. This is a pleasant place for a Saturday morning or Sunday afternoon bird walk almost any time of the year. Spring is particularly delightful to the eye because of the many blooming shrubs and trees. There are numerous benches where one may pause to listen for and watch birds and other wildlife. Local birders have not spent much time here, at least in an organized way, which is too bad because it has good potential. While there are no unusual birds reported from the park, most of the common land birds of the region are likely to show up. There is good nesting habitat for the breeding species. The adjacent creek is rather narrow but should be watched for Great Blue Herons and Belted Kingfishers. Both Red-tailed and Red-shouldered Hawks sometimes perch on the powerline structures overhead and in nearby trees. Watch for Gray Catbirds, Brown Thrashers and Eastern Towhees in the shrubbery. 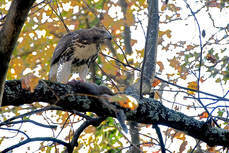 The Greensboro Arboretum is a pretty good place for other forms of wildlife watching in addition to birding. As the park’s name suggests, the gardening emphasis is on shrubs and trees, but there also are seasonal flowerbeds. Some of the plantings produce flowers, fruits, and/or seeds that are particularly attractive to birds, butterflies, and other wildlife. At the north end of the park there is a formal butterfly garden designed to look like two butterflies around a fountain. Near the Education Building is a vine arbor that has an extensive informal flower garden around it. This is particularly good for butterflies as well as other pollinators.